Traveling or running errands with a baby in tow can be quite challenging. For one, you have to bring a lot of stuff in case the baby gets hungry or needs diaper or clothes change. And when any of those needs arise, it can be exhausting if you have to fumble for the things you need in a roomy but cluttered bag. For this, we are now looking at the stylish and functional Be Marvellous’ All-in-One Diaper Bag Backpack as a solution to your needs. It is spacious and lightweight. Its basic and gender-neutral design makes it perfect for fashionable moms and dads. Its self-standing feature allows you to do what you need to do fast and easy. With all the interior and exterior pockets, it makes organizing your stuff and knowing where to look effortless. The lower back access and anti-theft pockets are helpful and clever design inclusions. The tissue slot is an ingenious way to access the most used baby item. No more messy hands working on the zippers. The bottle compartment can accommodate three bottles at a time. It is also insulated to keep baby’s food and yours warm or cold. Being a backpack type, it affords you free hands to keep up with your little one. You can also carry it using the top handle if you want to, or attach the bag to the stroller through its integrated stroller straps. The bottle compartment only accommodates small baby bottles. The Be Marvellous All-in-One Diaper Bag Backpack is a stylish bag that comes in a classic black or basic grey color, making it a perfect choice for chic parents. It is also a well-designed backpack that keeps its form and stays upright. It marries the wide access you get from a doctor’s handbag and the hands-free convenience from a backpack. Inside the bag are multiple pockets that make organizing super fast and easy. You have four elasticized pockets of varying sizes, which can fit a wide range of baby essentials, from diapers to smaller items. There’s also one zippered pocket, which is great to secure small or loose objects. In front of the bag, you will find an insulated compartment for small baby bottles and a mesh pocket on the inner cover. And on each side of this knapsack are zippered pockets as well, and one of them has a slit for easy access to baby wipes or tissue. The real design-win for this bag though is the zippered opening at the back that allows you to access the bottom contents without having to pull everything out. The inner part of this opening also provides you a safe place to stash your money and other valuables. So, you do not have to bring a second purse for your stuff. You also do not have to worry about pickpockets since your money is sandwiched safely between your bag and your back. There are three ways to carry the knapsack: one is through the backpack straps, another is via the top handles, and the last one is by the built-in stroller straps. Obviously, a lot of thought has been put in the design of this clever backpack. It even comes with a changing pad that folds up like a purse. This keeper of a bag helps you get organized and provides you easy access to your baby’s stuff as well as yours. It is also waterproof so you won’t have to worry about spill accidents. Or, if it is the other way around—your things are wet—it is able to keep the sodden clothes or items from soaking you. 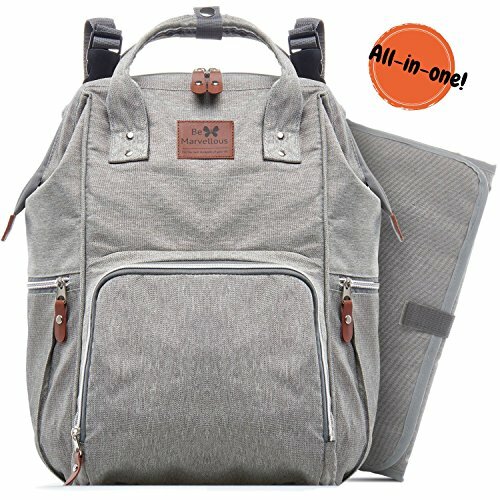 For all the great things that this all-in-one diaper bag backpack can do, it is a steal for its price. Making a good case against the All-in-One Diaper Bag Backpack of Be Marvellous is the Terrania diaper backpack. Like the former, this one comes with plenty of pockets, an integrated stroller strap, top handles, a diaper change pad, and an insulated pouch for the baby bottles. Moreover, this diaper backpack has soft sponge lumbar backpack pads. So, you might find this more comfortable to wear on your back. Additionally, if you do not like that you are limited to small bottles in the Be Marvellous knapsack, this one affords you space for taller ones. However, this Terrania diaper bag does not come with the clever back opening you would find in the Be Marvellous knapsack. So, you need to carefully plan how you arrange your baby’s essentials to avoid having to take the some, if not all, contents out just to access that clothing item resting at the bottom of the bag. The All-in-One Diaper Bag Backpack of Be Marvellous is perfect for stylish moms and dads with a love for or the need to keep things organized. It is designed not only with the baby’s essentials in mind but also the busy parent’s needs. We all know that a baby or a toddler can be a handful. This bag affords moms and dads the free use of both hands to attend to their little one while carrying around a heavy bag. It also helps them focus by buying them some peace of mind with their valuables cleverly hidden in an interior back pocket. With Be Marvellous’ All-in-One Diaper Bag Backpack, moms and dads can just focus on bonding with their kids or be running errands swiftly even with children in tow.